The SLSA uses Sponsor income to pay event prizes and staff payments. This is shown in the table below. Staff are paid at 300L per hour. The Top Section in green shows this season (2013 Season 1) number of sponsors at each sponsorship level, and hence the total sponsor income per event taking in to account 20% discounts for full season sponsorship. The Table shows a typical comp where the Open runs for 2 and the Pro for 5 hours giving 7 hours total for the comp overall. 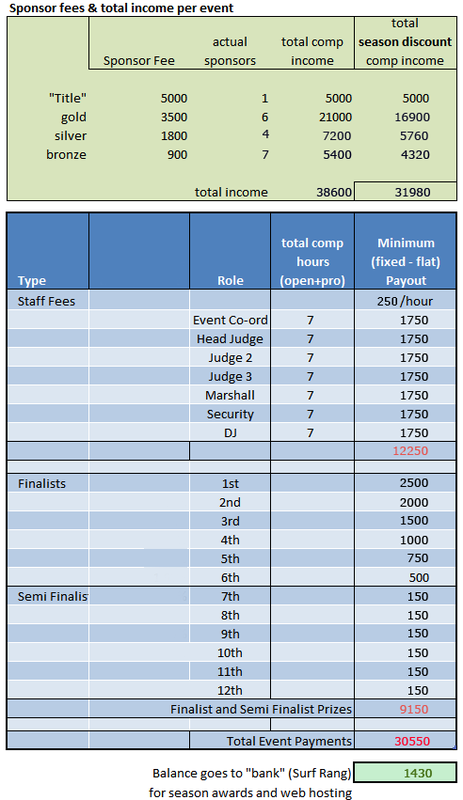 The exact comp duration is used for actual Staff Payments. Any balance remaining after the payouts will go into the SLSA “bank” and be used for end of season activities, equipment and web hosting.